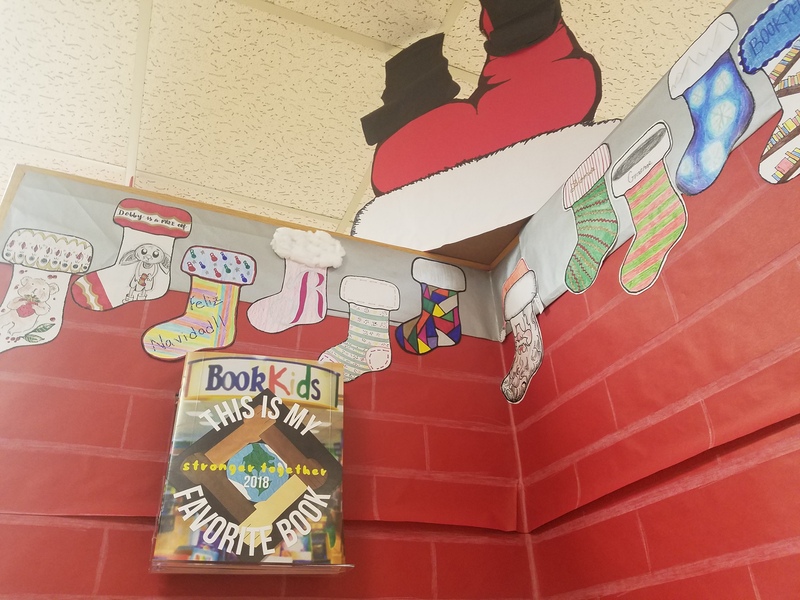 Snowflakes dangle from the ceiling, wrapped shelves gleam in gold and silver, catalogs are stacked on practically every surface, and books are piled as far as the eye can see. The holiday season is upon us, and the bookselling elves have certainly been busy! 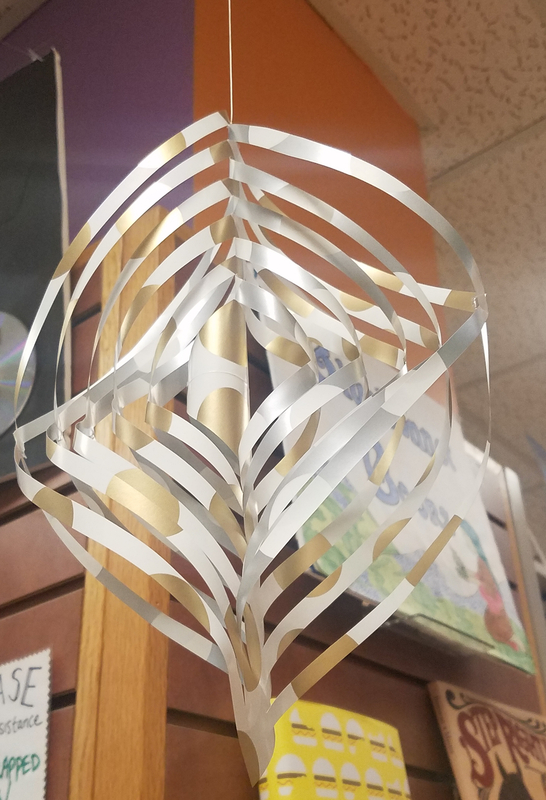 We just finished putting up our very last holiday display up today, so I thought it might be fun to check in with the mad paper cutting genius who spearheads our wrapping and cutting and twirling every year. 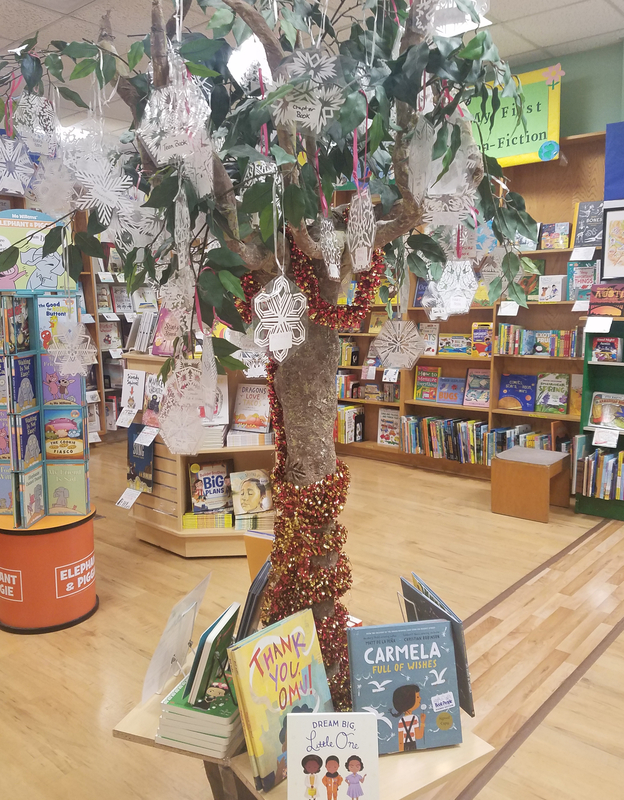 Merrilee Wilkerson has been making things look pretty at BookPeople for 24 years, and she graciously offered some expert tips for aspiring elves. Tip 1: If it doesn’t show, don’t wrap it. Anything pressed against the wall or backed into another fixture can go unwrapped. Don’t waste the effort. Tip 2: Google is your friend. Googling paper Christmas decorations turned up instructions for the mesmerizing “twirly gigs” now dangling from the ceiling throughout the section. Pro tip: The best ideas for displays come from online bulletin board designs. Those crafty educators come up with the best stuff! Tip 3: Cut corners where you can. If you want to wrap something in a new color for a while and then return it to its previous look, cover all the edges with clear packing tape so you can tape down the new paper and then just rip it off later, leaving the original paper pristine. 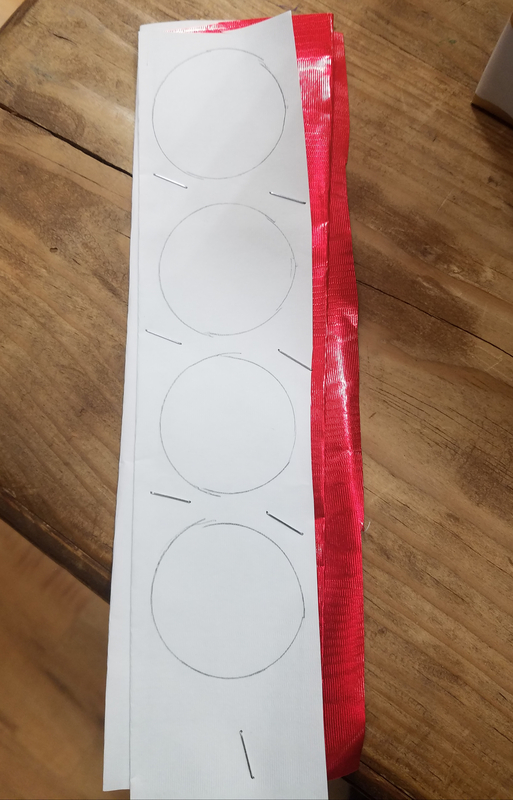 Pro tip: If you need to cut a lot of something, like polka dot circles, accordion your paper and then staple it together before cutting so the layers don’t shift. Tip 4: Use what you have. Rather than spending a lot of time measuring and calculating, Merrilee measures everything in scissor lengths. It’s what she’s got in her hand anyway, so why get out an extra tool? Tip 5: Make it personal. 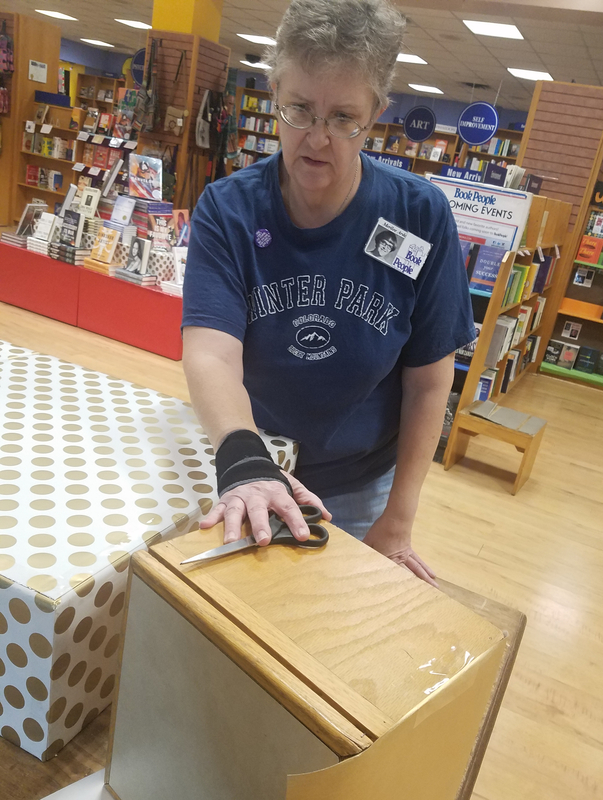 Every year, Merrilee goes the extra mile to hand-cut individual laminated snowflake tags for every gift on our Giving Tree, this year benefitting organizations Carrying Hope and BookSpring. The rest hang from the ceiling throughout the winter—no two designs the same. Tip 6: Take your time. When planning their amazing oversized Christmas tree for the picture book room (inspired by an online bulletin board design, naturally), Merrilee and Staci Gray pre-cut and pre-folded the paper pieces whenever they had a free moment for weeks, until it was all ready to go. To see their glorious Whoville-inspired masterpiece, make sure you watch the time lapse video at the end of the page! Tip 7: Tape, tape, tape, and more tape. Tape every joint, every seam, every place where paper meets wood or paper meets paper to produce the most polished end result. Tip 8: Know that no one cares about it as much as you. As much as you see slightly mis-aligned polka dots, a couple crinkled corners, and stubbornly wrinkled tape, everyone else just sees a delightfully festive display. So what’s my job in all this? I mostly get to bear witness to the magic and pass out compliments, which is a nice gig—although today Merrilee grudgingly allowed me to tape crimson polka dots onto gold cubes. (There were, admittedly, a few moments when they looked a bit more like chicken pox than polka dots, but I turned it around.) I also try to make sure we save and re-use as many carefully constructed creations as possible. This entry was posted in Uncategorized on November 30, 2018 by Meghan Dietsche Goel. WOW! All I can say is What a masterpiece!